While tall, focal point thriller flowers might be where you start your container garden, they aren't the most important bloom in the pot. "Spiller" plants, which trail over the side of the container, help soften the edges and create a more finished, professional look to your mini flower garden. Helichrysum is grown for its small, felt-like leaves. The most familiar is a soft blue-gray, but there are pretty variegated varieties, too. The stems grow upward and tumble down, making both a lovely backdrop and frame for the other plants in your container. Alternanthera has small colorful leaves that will trail and cover your container with charm. As a foliage plant, it will require negligible care from you while still looking good all season. Sweet alyssum prefers cool weather, but you can keep it blooming in a container if you give it regular water. Alyssum doesn't really trail as much as it gently flows over the top of your container. It's a very tidy plant with a wonderful, honey-like scent. Asarina has tubular flowers that resemble snapdragons. This is a short vine that will not just tumble out of your container, but it will ensnare itself in nearby plants—in the nicest of ways. Bidens are in the aster family. They have small, daisy-like flowers that are most familiar in yellow but also are now available in pinks, white, and orange. They will drape over the sides of your container and are extremely heat and drought tolerant. Laurentia forms a froth of finely cut foliage with dozens of lavender-blue, star-shaped flowers. It adapts to all kinds of growing conditions. Although it blooms repeatedly, you will get more flowers if you give it a shearing in mid-season. You can do this in stages so that you are never totally without flowers. Daisy-like flowers in purple, blue, and white cover this profuse bloomer. And the lacy green foliage of swan river daisy is just as nice as its flowers. 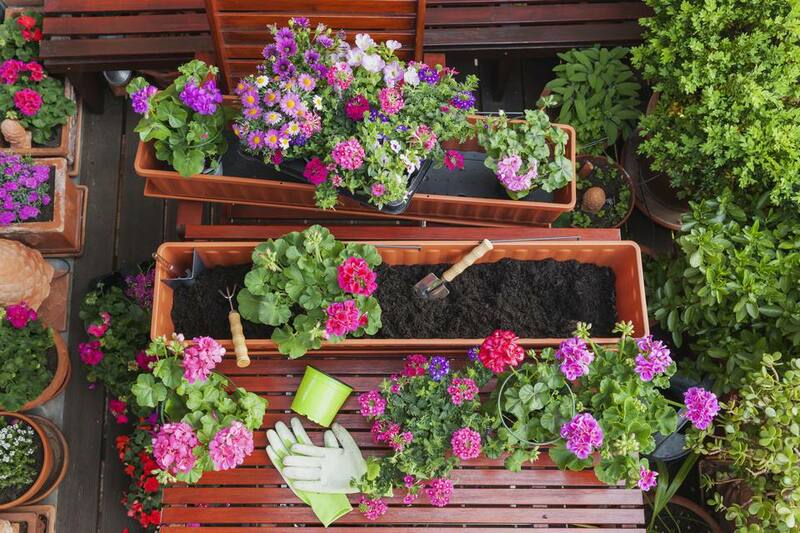 As the plant gets top heavy with flowers, it will spill over the sides of your container. Calibrachoa is related to petunias, but the flowers are much smaller. Don't let the delicate nature of this plant fool you; "Million Bells" will set what seems like a million flowers during the course of the summer. It has a lovely trailing habit. Cup and saucer vine is a graceful vine that can grow up on a small trellis or be allowed to drape and circle your container, weaving itself through the other plants. The bracts create the saucer that the cup-shaped flowers sit on. Although not in the same genus as zinnias, you will certainly notice the resemblance of the creeping zinnia to its namesake. As its common name implies, creeping zinnia grows outward and forms a dense mat that will spill over the sides of a container. It is covered in yellow flowers the entire summer. Glory flower is an evergreen perennial vine in tropical climates, and it grows fast enough to be used as an annual in containers, where it will produce clusters of narrow, tubular, tri-colored flowers as it cascades over the sides. Candytuft is hardy in USDA Hardiness Zones 5–9 and makes a wonderful ground cover. In the confinement of containers, it blooms its heart out while covering the base of the vessel. It may overwinter if you plant it in your garden at the end of the season. Sweet potato vines have become garden staples as ground covers and especially as container plants. The leaves can be heart-shaped or almost oak-like. The choice of colors expands every year, from chartreuse to near black. Although the ornamental sweet potato isn't grown with the intention of harvesting the tuber, you will still end up with an edible vegetable at the end of the season—just maybe not as tasty as the varieties grown to eat. 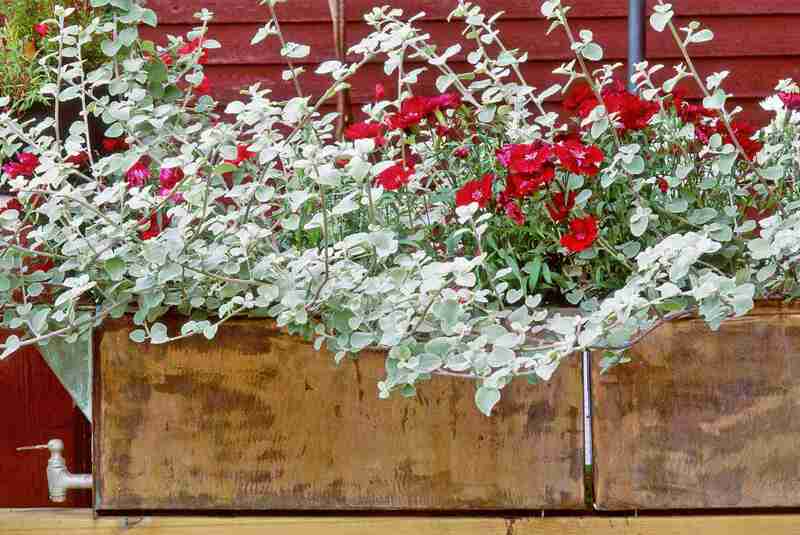 Perlagonium geraniums are classic container plants. The ivy form has smaller flowers but blooms just as abundantly as the upright form. Ivy geranium will spill over the edges of your container. And, like its upright relative, it can handle heat and short periods of drought well. The cascading form of lobelia comes in one of the truest blues you will find in the garden, and it will form a beautiful arch over your container. Unfortunately, this lobelia has a habit of not blooming when the weather heats up. You can try and overcome that with plenty of water and some partial shade, or you can be patient and wait for the weather to change. Parrot's beak is a tropical evergreen that is planted both as a houseplant and as an annual in containers. The common name refers to the unusual look of the flowers. Parrot's beak takes hot weather in stride. Both the foliage and the flowers stay fresh and attractive. Nasturtium plants form a mounding tumble of lily pad–like leaves and bright, cheerful flowers. Although they prefer the cooler seasons, if kept watered, they should bloom all season. The entire plant is edible, including the seeds, and including some in your salad really makes it look fancy. Plectranthus is grown for its silver-gray leaves. It grows upright until it topples over from its own weight. Some varieties will flower, most notably "Mona Lavender," with spiky sprays of lavender blooms. Fan flower is an evergreen tropical plant with deep green leaves and odd little flowers that have petals only halfway around their center disks, giving them the look of a fan. Their light purple color blends well with most other plants. No relation to Rudbeckia, the black-eyed Susan vine is far more delicate. With tiny five-petal flowers in yellow, peach, or white, this vine will grow into a jumble and find its way through, over, and under the other plants in your container, quickly filling any empty spaces. There are many verbena varieties, but the perennials will give you the most bang. They will bloom in their first year, in fact quite profusely. Although they are perennial, they tend to be short-lived, because they expend so much energy on flowering. They are also very heat tolerant. Vinca plants are often used as a flowering ground cover (such as Vinca minor), so it's a natural for trailing over the sides of containers. If you want blooms all season long, though, you'll want the Madagascar periwinkle, rather than Vinca minor, which blooms mainly in the spring. Wave petunias just keep getting better. They are such an improvement over the old-fashioned petunias that turned to mush after a rain and needed constant pinching and deadheading to keep flowering. Wave petunias spread out and down and flower without any effort from you, all season long. You can't beat zinnias for heat tolerance and bold colors. The "Crystal" cultivar series of narrowleaf zinnias are slow spreaders and profuse bloomers. You can expect good powdery mildew resistance, too, as they pour out of your container.